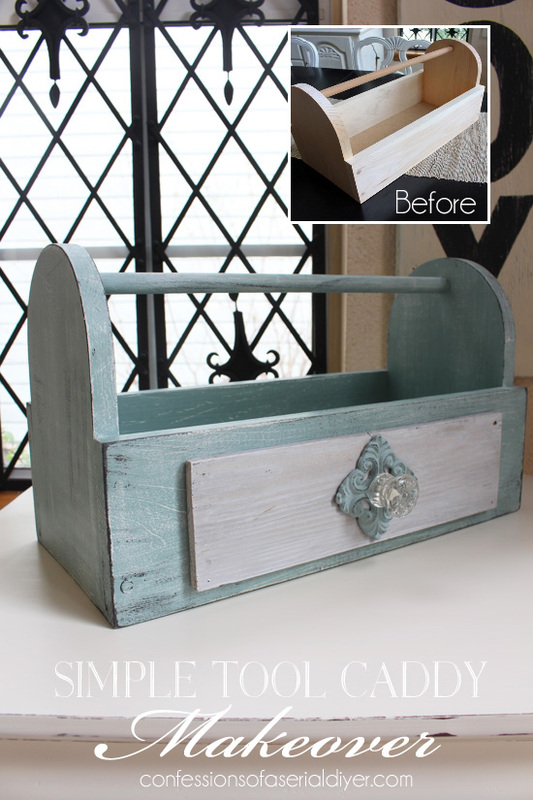 Simple Tool Caddy Makeover and an Awesome Giveaway! Hi Friends! 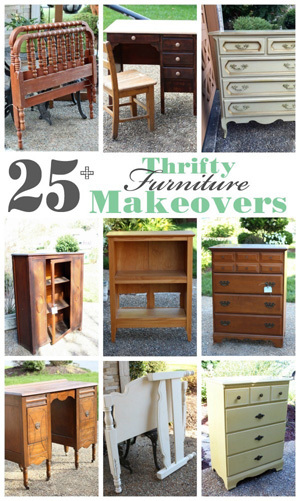 I am so excited to be part of an awesome giveaway today, but first I have a quick makeover to share! Last summer I went to my first blogging conference. I roomed with my good friend, Nancy from Artsy Chicks Rule. You can read all about it here. I’m not sure if they actually sell these at your Home Depot store, but you can buy similar kits from them online here. Putting it together only took a few minutes. 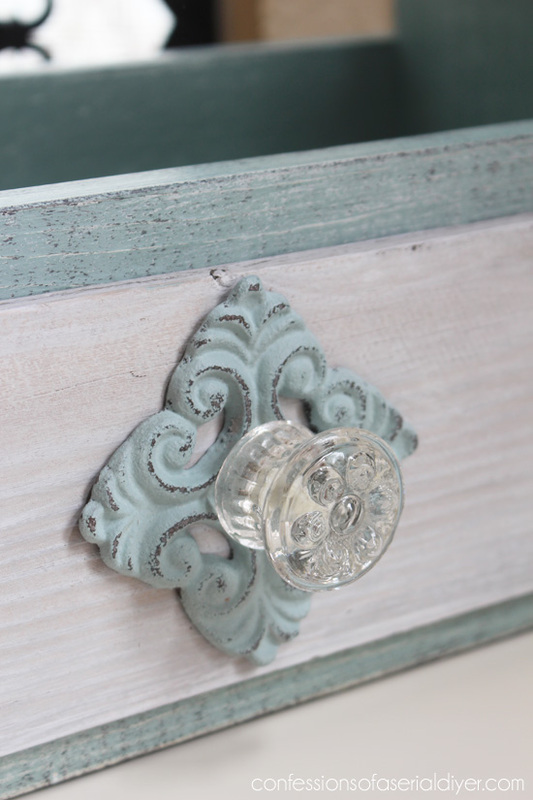 I painted it in Duck Egg Blue, then dry-brushed it with white and graphite, followed by a coat of clear wax. The piece on the front is part of an old fence picket that I dry brushed. The knob is from Hobby Lobby as is the metal plate behind it. 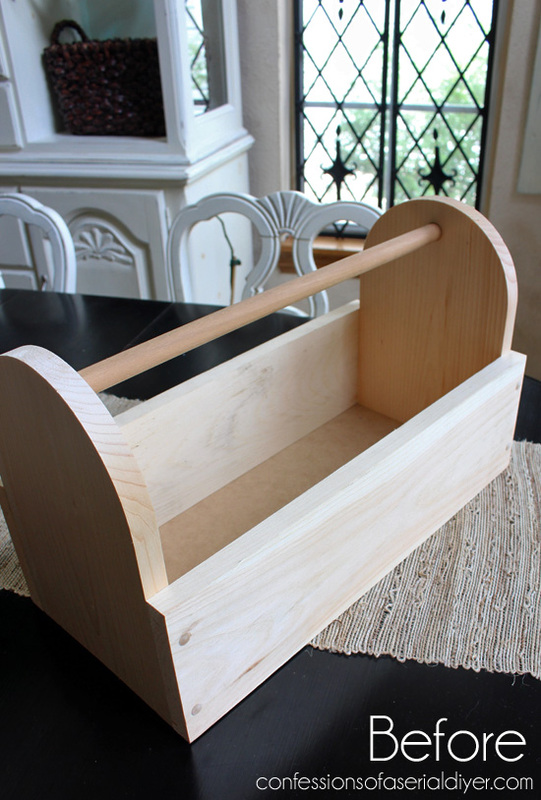 It’s a very simple update, but it turned out pretty cute and there are so many uses for a simple caddy like this. It sold the day after I dropped it off at my booth. Seriously…it will be delivered right to your door! 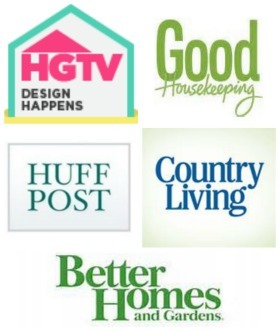 Several of her blogging buddies are here to help celebrate by sharing this awesome giveaway with her! This giveaway will run through midnight on Sunday, May 17th, and is open to US residents only. The winner will be announced Monday, May 18th. To enter, just follow the tasks below. There are several chances to enter! Good luck and have a great day, my friends! The desk and chair is gorgeous. OMGOSH I WOULD LOVE TO SEE THIS IN MY BEACHY BEDROOM AND LOVE IT!!!! I love the reupholstered headboard! 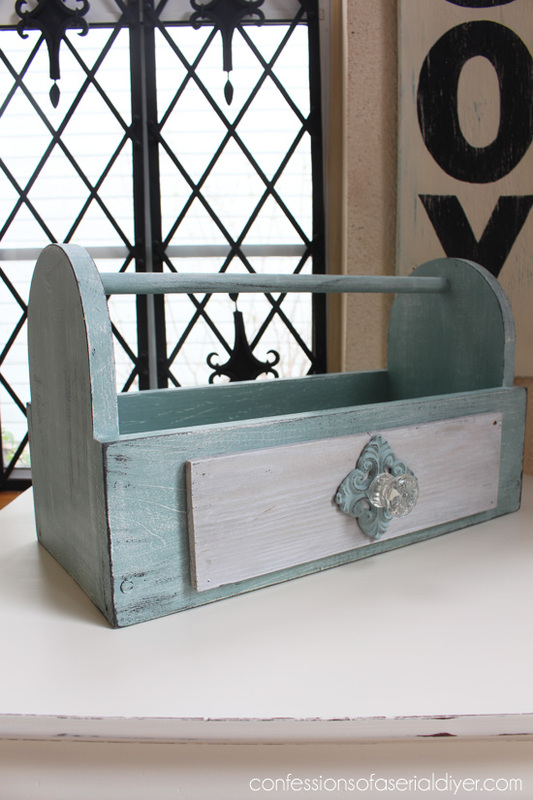 Trust you Christy to come up with a way to glam a simple tool box – so pretty! 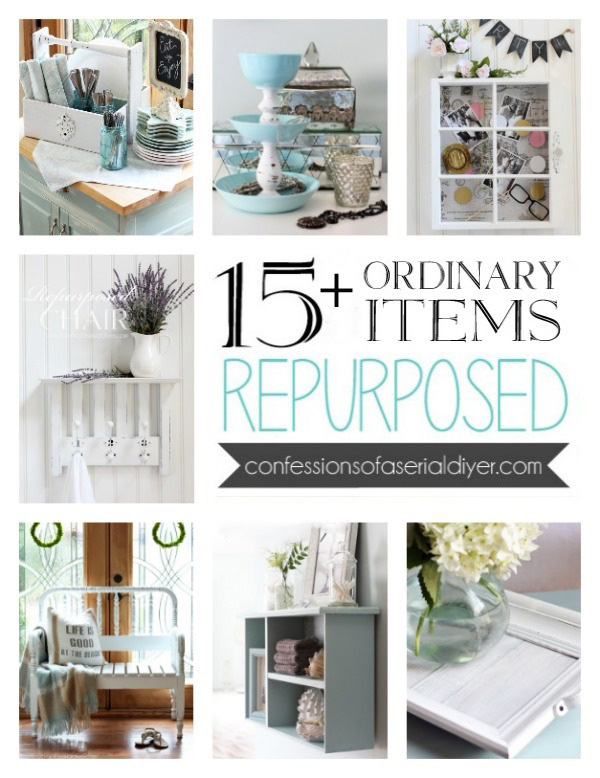 I could see it filled with pretty hydrangeas in colored mason jars. Wow, that is one generous giveaway Larissa is offering! I love your make overs! March was super fun and ambitious of you! Keep up the great work! WOW what an awesome give-away! I can’t believe it. Thanks so much for this. I hope I win!!! I love the duck egg blue. Very well done! Absolutely LOVE the projects you make! 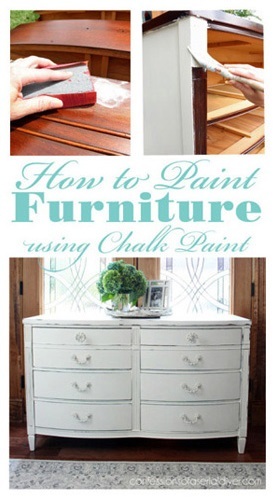 So excited to try my hand at chalk paint. 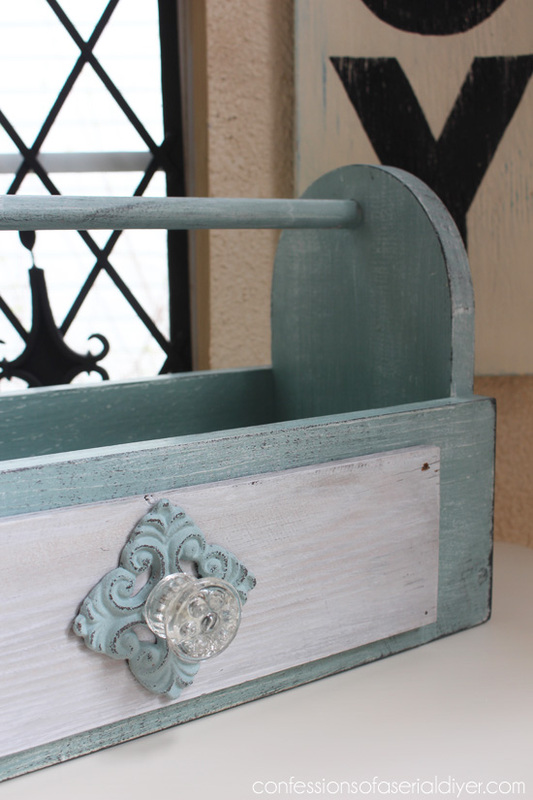 Another super cute makeover on the tool caddy! You’ve inspired me to take a look at a lot of old things I have awaiting finishing and get them done. Love the colors you work with! Thanks for the great giveaway opportunity. You are such an inspiration! I love seeing what you do! Oh cute! Love what you did with yours! 🙂 And thanks for the shout out! Amazing what some paint and good taste will do! I’m very impressed! You made that tool caddy look terrific! I”ll bet it will be gone the next time you swing by your booth. Love all of your projects always turn out great!!!! Keep up the good work, always inspiring. The desk is wonderful how great it would be to win! 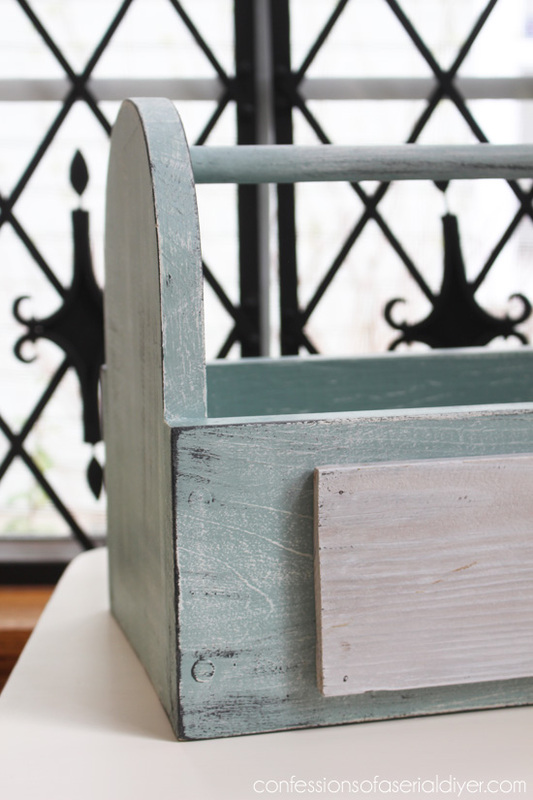 How i just adore the tool caddy makeover!! The color paint is SO WONDERFUL, and I’m glad you told us the name of it! Love the know + fence on the front as well!!! TFS!!! Love the desk and chair! Many thanks for the giveaway-would love to win!! Your tool caddy makeover is the best…love it!! Love your toolbox and what you did to it! I can see why it sold so fast! Love, love, love that desk!! 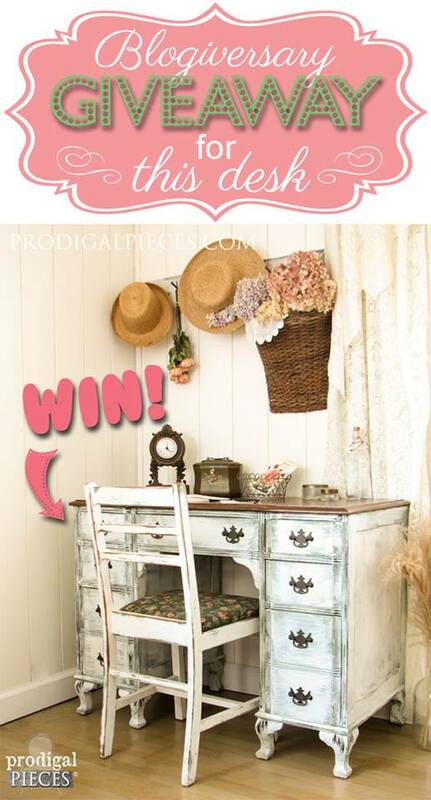 What a great give away, would love to win this, thank you! 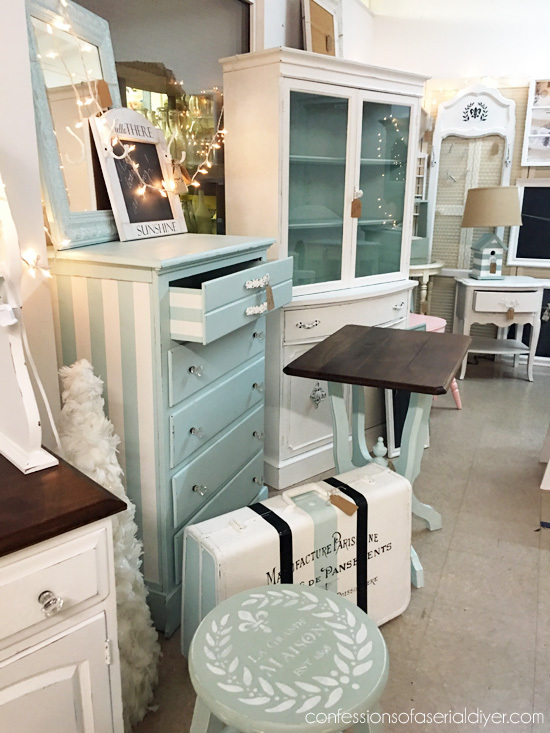 hi, i love all the vintage and antique pieces, especially the ‘custom-handcrafted-farmhouse bench w/ storage’. I love the shelf. Thanks for the giveaway. 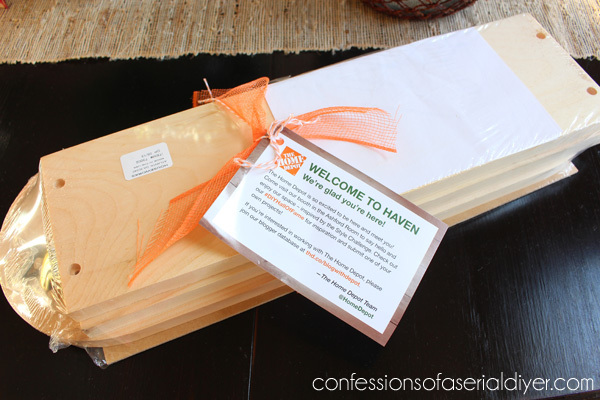 How cute is this…great giveaway!! !